Stone products typically found in the kitchen and bathroom are Granite or Quartz, Marble, and Flagstone. Natural stone provides a hard porous surface on which to work. Granite and Marble can be found on both counters and flooring while Flagstone is typically a flooring material. Countertops made with polished granite, a natural stone, are quite popular in high-end kitchens. The stone gives a sense of beauty and warmth combined with a surface that is durable and can tolerate the use found in the kitchen. When compared to marble, another natural stone, granite is not as subject to staining and scratching and it is more slip resistant. 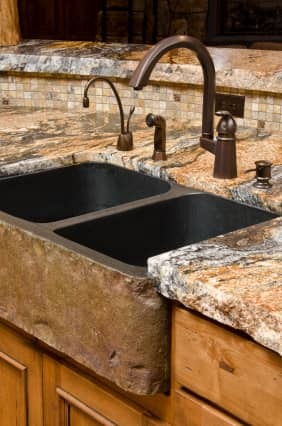 Granite can be found in three finishes: a highly polished surface, which is found on most countertops; a thermal finish, which has a rough finish; and a honed finish, which is more slip resistant and is typically used on floors. When granite is specified for a project, the dimensions of the cabinet layout are provided to the fabricator who will manufacture the countertop in an off- site facility. When it’s delivered to the job site it’s ready for installation. For most countertops the best thickness is 11⁄4”. While more costly than 3⁄4” slabs, the added thickness provides more strength for extensions. It also reduces the risk of breakage during transportation. Quartz counters are very similar to granite and are made from around 95% natural stone material. It is then crushed and blended with very hard polymer making it much more durable than other natural stone materials. Quartz counters also do not need to be sealed, are resistant to heat and cold, and are nonporous making staining unlikely. This material is brittle and must be handled with care during installation. The edges of marble must be protected or chipping or fracturing may occur. Marble can be very slippery when wet. When used as a flooring material, ensure that the finish is etched, honed, or pummeled to make it slip resistant.Marble can be found in red, yellow, green, white, and black. Some have directional patterns, while others have a general design. You will find marble rated in four levels of fragility, A, B, C, and D. A and B marbles are relatively sound while C and D are more fragile. Normally countertops of marble are made of large slabs in much the same way as granite. Thickness of the slabs vary from 3⁄4” thick to 11⁄2” thick. An alternative to the large slabs is 6”x6” marble tiles which are installed in the same fashion as ceramic tiles. Flagstone is typically a bluestone or slate that has been split into thin slabs. This material is used in flooring, but seldom in countertops. Both of these materials absorb and retain heat and can get very hot if used in direct sunlight.